It has been suggested that Cadillac CTS-V be merged into this article. (Discuss) Proposed since October 2018. The Cadillac CTS is a executive car manufactured and marketed by General Motors, and now in its third generation. Historically, it was priced similar to cars on the compact luxury spectrum; but it has always been sized closely to its mid-size rivals. The third generation competes directly with the mid-size luxury cars. Production on the model will be ended on June 1, 2019. Initially available only as a 4-door sedan on the GM Sigma platform, GM had offered the second generation CTS in three body styles: 4-door sedan, 2-door coupe, and 5-door sport wagon also using the Sigma platform — and the third generation in coupe and sedan configurations, using a stretched version of the GM Alpha platform. Wayne Cherry and Kip Wasenko designed the exterior of the first generation CTS, marking the production debut of a design language (marketed as "Art and Science") first seen on the Evoq concept car. Bob Boniface and Robin Krieg designed the exterior of the third generation CTS. Introduced in early 2002 as a 2003 model, the CTS sedan was built on GM's new rear-wheel drive Sigma platform and sported a fully independent suspension. It was the first Cadillac to be offered with a manual transmission since the 1988 Cimarron. The CTS was designed as a replacement for the Opel-based Catera. Wayne Cherry and Kip Wasenko designed the exterior of the first generation CTS and this vehicle marked the production debut of the "Art and Science" design language first seen on the Evoq concept car. CTS vehicles are built at GM's Lansing Grand River Assembly in Lansing, Michigan. Originally powered by a 3.2 L LA3 V6 producing 220 hp (164 kW), the CTS received an updated 3.6 L DOHC V6 with variable valve timing as an option in 2004, producing 255 hp (190 kW) and 252 lb⋅ft (342 N⋅m) of torque. The 3.2 L engine went out of production in 2005, when a new 2.8 L version of the DOHC V6 debuted in an entry-level version of the CTS. In Europe, the 2.8 L replaced the previous entry-level 2.6 L engine. The CTS was originally offered with either GM's in-house five-speed 5L40-E automatic transmission or a five-speed Getrag 260 manual transmission. For the 2005 model year, the Getrag was replaced with an Aisin AY-6 six-speed. In 2004, GM introduced the CTS-V, a high performance version of the CTS intended to compete with luxury performance sedans like the BMW M3/M5, Audi S4/S6, and Mercedes-Benz C and E-class AMGs. The 2004 and 2005 CTS-Vs were equipped with the 5.7L LS6 V-8 (400 hp at 6,000 rpm, 395 ft-lb at 4,800 rpm), a Tremec T56 6-speed manual transmission, 14+" rotors and Brembo 4-piston calipers front and rear, suspension upgrades (higher spring rates, stiffer anti-roll bars, two available damper packages), and subtle exterior changes. As the LS6 was phased out, the 2006 and 2007 CTS-Vs received the 6.0L LS2 V-8, which carried the same HP and torque ratings (with peak torque coming 400rpm sooner). A prototype first generation CTS station wagon was made but it was never put into production. GM revealed the all-new 2008 CTS at the North American International Auto Show in January 2007. The 2008–2009 base model featured a 3.6 L LY7 V6 with 263 hp (196 kW) and 253 lb⋅ft (343 N⋅m) of torque carried over from the previous generation. A second engine, a new 3.6 L direct-injection V6 VVT engine with 304 hp (227 kW) and 273 lb⋅ft (370 N⋅m) of torque was also offered. For 2010, the base engine changed to a 3.0L variable valve timing (VVT) V6 with 270 hp (201 kW) and 224 lb⋅ft (304 N⋅m) of torque. A 6-speed manual transmission was standard equipment on the second generation CTS and GM's 6-speed Hydra-matic 6L50 automatic transmission was available as an option on all variants. On-demand all-wheel drive was offered with both engines when equipped with an automatic transmission. Suspension, braking, and steering improvements from the previous generation CTS-V were designed into the new standard CTS. The second generation CTS was wider and longer than the original, measuring 191.6 in (4,867 mm) long, 72.5 in (1,841 mm) wide and 58 in (1,473 mm) in height. Wheelbase remained unchanged at 113.4 in (2,880 mm), but with a wider front/rear track of 61.8 / 62.0 inches (1575 / 1585 mm), donated by the larger STS. Other changes included a revamped exterior, with a new, larger grille, slimmer headlights and taillights, side air extractor vents located forward of the front doors, and new nine-spoke 18-inch wheels, surrounding larger high-performance brake calipers and rotors. Available features on the second-gen CTS included a Bose 5.1 surround sound system, GM's Stabilitrak ESC system, a tire pressure monitoring system, a navigation system with real-time traffic and weather data, an integrated 40 GB hard drive for music storage, swiveling headlights, and remote starting. In 2008, the General Motors chose the CTS to re-launch the Cadillac brand in Australia and New Zealand. However, in early 2009, amidst the global financial crisis, a last-minute decision was made not to go ahead with the launch. As a result, a small batch of cars which had already been shipped to Australia had to be returned to the factory. During the 2010 model year, the GM badges were dropped, although early 2010 models still had GM badges. For the 2012 CTS, the front grille used higher quality materials to give a more vertical design, and the Cadillac logo was being subtly changed to give a more vibrant appearance. The biggest change was to the engine. Although kept the same 3.6-liter displacement, the V6 was able to produce 323 horsepower while dropping weight thanks to some modified engine internals. 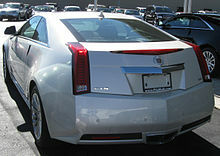 For 2012, GM also offered some new technology and option packages with the Cadillac CTS. At the 2008 North American International Auto Show in Detroit, General Motors unveiled a coupe concept version of the CTS, alongside the new CTS-V performance sedan. The coupe's unveiling surprised the media and public, stealing a great deal of attention away from the CTS-V. In November 2009, the production version was unveiled in a press release. The coupe went into production in spring 2010 for sale in August 2010 as a 2011 model. The design of the production model is very similar to the concept, with the B-pillars still removed. The standard engine will be a 3.6L direct injected V6 rated at 304 hp. Like the sedan, both six-speed manual and automatic transmissions, in either RWD or AWD configurations, were available. A CTS-V Coupe was introduced, first shown at the 2010 North American International Auto Show in Detroit. The CTS Coupe was Cadillac's first coupe since the Eldorado, which was discontinued in 2002. The CTS Coupe was discontinued after the 2014 model year, and the CTS-V Coupe discontinued after the 2015 model year. At the 2008 Pebble Beach Concours d'Elegance, Cadillac presented the 2010 CTS Sport Wagon. The wagon became available in late 2009 as a 2010 model. A CTS-V version was added for 2011. The CTS Sport Wagon is available in either rear-wheel-drive or all-wheel-drive layouts, and is powered by either a 3.0-liter DOHC V6 engine or a 3.6-liter V6 with variable valve timing. The 3.0-liter engine produces 270 horsepower, and the 3.6-liter produces 304. The car is made for primarily the European market, where in some countries, wagons are preferred to sedans. With the third generation, Cadillac ceased production of the CTS wagon. In 2008, Motor Trend named the CTS Car of the Year. On March 26, 2013, Cadillac unveiled the third generation of the CTS. The 2014 CTS uses the 2.0L turbocharged I4 and 3.6L V6 from the ATS and also offers an all-new twin turbocharged V6 producing 420 horsepower (313 kW) and 430 lb⋅ft (583 N⋅m) of torque. The twin turbocharged engine is only available in the CTS Vsport, a new trim that serves as a step between the 3.6L V6 and the high-performance CTS-V. Despite carrying the CTS name, the third generation model is actually closer in size and market position to the former STS. Bob Boniface and Robin Krieg designed the exterior of the third generation CTS. Eric Clough designed the interior. General Motors began assembling 2014 CTS sedans intended for sale to customers on 16 September 2013. Sales began in October 2013. Motor Trend named the third-generation CTS its 2014 Car of the Year. As customary with award winners, the magazine acquired a CTS (in Vsport trim) for a long-term test. Its verdict lauded the car's driving dynamics and reliability but criticized its CUE multi-media interface. In a four-way comparison in the December 2013 issue of Car and Driver the 2014 CTS 3.6 placed second overall. The article praised the handling of the CTS stating "[The CTS] is the only car in this group that didn't just put up with hard driving, it indeed goaded its driver to go faster." and praised the stopping ability, stiff structure and light weight of the car. The article criticized the engine for being "coarse in the upper ranges", the acceleration times, the fuel economy and the CUE entertainment system. Sales concerns led Cadillac to offer rebates to the 2014 models and lower sticker prices on the 2015 models. All engines available in the 2014 CTS are constructed from cast aluminum blocks and heads and use direct injection and variable valve timing. For the 2016 model year, the 6-speed 6L45 automatic transmission was replaced by the new 8-speed 8L45 automatic transmission, with the 8L45 also taking over duties with the naturally aspirated 3.6L V6 from the 8-speed Aisin TL-80SN automatic transmission. V-Sport models will continue to use the 8-speed Aisin TL-80SN. A new 3.6L V6, the LGX, replaced the 3.6L V6 LFX. In its first year of production, the first-generation CTS was nominated for the 2002 North American Car of the Year award. The gen-2 CTS/CTS-V won MotorWeek's Driver's Choice Awards for "Best Sport Sedan" in 2008 and 2009. The second-generation CTS won the 2008 Motor Trend Car of the Year award and was chosen as one of Car and Driver's 10Best cars. In 2009, the second-generation CTS and CTS-V were chosen for the Car and Driver 10Best list, making the CTS the first Cadillac to be chosen twice in consecutive years. In 2010, the second-generation CTS and CTS-V returned to the Car and Driver 10Best list under the sub-headline "Maybe the best American car ever made". The CTS-V made the Car and Driver 10Best list again in 2011 and 2012. The third-generation CTS won the 2014 Motor Trend Car of the Year award and was named to the Car and Driver 10Best list. Also in 2014, the CTS ranked number one among Upscale Midsize Cars according to U.S. News & World Report. The success of the CTS has been attributed in part to the car's placement in the 2003 sci-fi action film The Matrix Reloaded. The producers of the film were seeking a car that would complement the film's atmosphere. General Motors suggested the then-unreleased CTS to the filmmakers, who accepted; ten prototypes damaged to different extents were used to represent the film's star car, a silver CTS. The CTS-V is a high-performance version of the CTS. The previous model features a supercharged 6.2L LSA V8 engine producing 556 hp (415 kW) and 551 lb⋅ft (747 N⋅m) of torque. The first generation CTS-V was introduced in 2004 as a 4-door sedan and was available through 2007. The second generation CTS-V sedan, coupe and station wagon was sold through 2014, concurrent with the third generation standard sedan, until the third generation CTS-V was ready. Total combined sales of all Cadillac CTS models by year. ^ Thomas Barrabi (November 27, 2018). "These 6 GM vehicles are ending production". Fox News. Retrieved November 29, 2018. ^ a b "Группа компаний Автотор :: Автомобили GM" (in Russian). Avtotor.ru. Archived from the original on February 10, 2016. Retrieved 2010-11-19. ^ a b Newbury, Stephen (2002). The Car Design Yearbook 1. Merrell Publishers Limited. ISBN 1-85894-190-3. ^ "Cadillac History". Edmunds.com. Edmunds. Archived from the original on 2009-04-03. Retrieved 2007-04-21. ^ "2008 Cadillac CTS Performance Review". U.S. News & World Report LP. Retrieved 2018-12-21. ^ Hellwig, Ed (2007-01-08). "Detroit Auto Show: 2008 Cadillac CTS". Edmunds Inside Line. Edmunds. Archived from the original on 2008-03-18. Retrieved 2009-04-12. Both transmissions will be offered with the high-output engine, along with another new option for 2008 — all-wheel drive. ^ Pimpo, Tony (2011-04-19). "Cadillac Tweaks CTS Lineup for 2012". Automoblog.net. Automoblog.net. Retrieved 2011-04-19. ^ "2011 Cadillac CTS Coupe: New Sports Coupe Is Cadillac's Most Dramatic Design" (Press release). Los Angeles: General Motors. 2009-11-23. Retrieved 2013-12-08. ^ Riches, Erin (2009-11-19). "2011 Cadillac CTS-V Coupe Will Debut in Detroit". Blogs.insideline.com. Retrieved 2009-12-24. ^ "Monterey 2008: Cadillac unveils 2010 CTS Sport Wagon". 2008-08-15. Retrieved 2008-08-15. ^ "Cadillac Rolls Out All-New SRX Crossover & CTS Sport Wagon". Automoblog.net. ^ a b "2014 CTS Sedan Stretches Cadillac's Design Philosophy" (Press release). Detroit, Michigan: General Motors Company. 2013-03-26. Archived from the original on 2013-09-18. Retrieved 2013-09-18. "There’s an intuitive and connected feel to the cabin, with asymmetrical features that focus the controls and displays on the driver," said Eric Clough, Cadillac director of interior design. ^ a b c Zenlea, David (2013-03-26). "2014 Cadillac CTS First Look". Automobile. Source Interlink Media. Archived from the original on 2013-12-08. Retrieved 2013-12-07. The 2014 CTS rides on a stretched version of the Alpha platform that underpins the ATS. Compared with the current car's platform, which dates back to the first CTS, the Alpha architecture employs more lightweight materials and features much daintier components – thinner control arms, smaller fasteners. ^ Ewing, Steven J. (2013-03-26). "2014 Cadillac CTS Debuts New Design, Twin-Turbo Power, VSport Model [w/video]". Autoblog. AOL. Archived from the original on 2013-12-08. Retrieved 2013-12-07. On the powertrain front, we already told you about the brand-new twin-turbocharged 3.6-liter V6 that will make its debut in the 2014 CTS, pumping out 420 horsepower and 430 pound-feet of torque through a new eight-speed automatic transmission. ^ "Lansing Grand River Builds Millionth Cadillac" (Press release). Lansing, Michigan: General Motors. 2013-09-16. Archived from the original on 2013-11-09. Retrieved 2013-11-08. The millionth Cadillac built at the Lansing Grand River Assembly Plant rolled off the line today. Fittingly, the milestone vehicle is an early model of the redesigned 2014 CTS sedan, which goes on sale in October. ^ "Cadillac drops price on CTS sedan by up to $3,000". autonews.com. 2015-01-07. Retrieved 2015-02-03. ^ "NACTOY – Previous Finalists & Winners". The North American Car and Truck of the Year Awards. Archived from the original on 2013-11-02. 2002 CAR finalists: Nissan Altima, the Ford Thunderbird and the Cadillac CTS. The winner was the Nissan Altima. ^ St. Antoine, Arthur (January 2008). "2008 Motor Trend Car of the Year Winner: Cadillac CTS". Motor Trend. Source Interlink Media. Retrieved 2013-12-07. ^ "2008 Cadillac CTS – 10Best Cars". Car and Driver. Hearst Communications. January 2008. ISSN 0008-6002. OCLC 38224673. Retrieved 2011-02-15. ^ Swan, Tony (January 2009). "2009 Cadillac CTS / CTS-V – 10Best Cars". Car and Driver. Hearst Communications. ISSN 0008-6002. OCLC 38224673. Retrieved 2011-02-15. ^ "2010 Cadillac CTS / CTS-V – 10Best Cars". Car and Driver. Hearst Communications. November 2009. ISSN 0008-6002. OCLC 38224673. Retrieved 2011-02-15. ^ "2011 Cadillac CTS-V – 10Best Cars". Car and Driver. Hearst Communications. November 2010. ISSN 0008-6002. OCLC 38224673. Retrieved 2011-02-15. ^ "2012 Cadillac CTS-V". Car and Driver. Hearst Communications. December 2011. ISSN 0008-6002. OCLC 38224673. Retrieved 2012-09-18. ^ Valdes-Dapena, Peter (2013-11-07). "Cadillac CTS Named Motor Trend Car of the Year". CNN Money. Cable News Network. Archived from the original on 2013-11-07. Retrieved 2013-11-07. The redesigned Cadillac CTS has been named Car of the Year by Motor Trend magazine, a top industry honor. ^ Evans, Scott (January 2014). "A Car for All Seasons: Motor Trend Car of the Year 2014: Cadillac CTS". Motor Trend. Source Interlink Media. 66 (1): 70–75. Archived from the original on 2013-11-07. Retrieved 2013-11-07. The CTS' intended function was to take the fight to BMW, Mercedes-Benz, and Audi – and win. And it has. ^ Quiroga, Tony (January 2014). "Chassis Masters: 2014 Chevrolet Corvette Stingray / Cadillac CTS". Car and Driver. Hearst Communications. 59 (7): 46–50. ISSN 0008-6002. OCLC 38224673. Archived from the original on 2013-12-08. Retrieved 2013-12-07. ...GM has achieved a rare numerical feat: two cars on our 10Best list. ^ "Best Upscale Midsize Cars Rankings | U.S. News Best Cars". Usnews.rankingsandreviews.com. Archived from the original on 2015-04-08. Retrieved 2016-06-14. ^ "Matrix Reloaded, Cadillac Remade". Motor Trend. Source Interlink Media. August 2005. Retrieved 2007-04-21. Cadillac believes appearance is everything and the deft product placement in this summer's slickest sci-fi extravaganza may grant the luxury brand more youth appeal than Led Zeppelin's entire back catalog could accomplish. ^ Cadillacs in The Matrix. MSN Autos. Microsoft. 2004-09-06. Archived from the original (Web video) on June 6, 2011. Retrieved 2010-11-19. ^ by GM Authority Staff (2013-05-26). "2014 CTS-V Sedan Updates, Information". GM Authority. Retrieved 2016-06-14. ^ "GM Reports December 2005 and Year Results". Retrieved 2012-01-06. ^ "GM Media Online". Media.gm.com. 2007-01-03. Archived from the original on June 21, 2007. Retrieved 2009-04-12. ^ "GM Media Online". Media.gm.com. 2009-01-05. Archived from the original on February 21, 2009. Retrieved 2009-04-12. ^ "Deliveries December 09". Retrieved 2012-01-06. ^ "December 2010 Sales: General Motors – Cheers & Gears Forums". Cheersandgears.com. Retrieved 2011-01-04. ^ "December 2011 Sales: General Motors – Cheers & Gears Forums". Cheersandgears.com. Retrieved 2012-01-04. ^ "GM's U.S. Sales up 5 percent in December". media.gm.com. Retrieved 2013-01-03. ^ "GM U.S. Deliveries for December 2013" (PDF). General Motors. 2014-01-03. Retrieved 2014-01-06. ^ "GM Deliveries up 19 percent in Blockbuster December". General Motors. 2015-01-05. Retrieved 2015-01-08. ^ "The Startling Decline of Cadillac CTS - FAXVIN Blog". vincarhistory.com. 20 November 2016. Retrieved 8 April 2018. ^ a b "Cadillac global sales grow 24.5% in December, 7.5% in 2015". cadillac.com. Retrieved 8 April 2018. ^ "Chevrolet and GM Lead U.S. Retail Sales and Share Gains for 2016". Media.gm.com. 2017-01-04. Retrieved 2017-01-04. ^ "Three-peat: Chevrolet's Retail Share Grows for Third Consecutive Year – up 1 point since 2015". gm.com. Retrieved 8 April 2018. 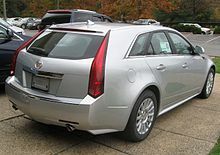 Wikimedia Commons has media related to Cadillac CTS.